As a recruitment process outsourcing provider and industry insider, we come across a lot people who are pretty confused about the subject. It’s not really surprising when you consider all the mixed messages and inaccurate information about RPO out there – the waters have gotten pretty muddy. With the increasing complexity of recruiting, and the surging organizational focus on top talent to achieve strategic growth, companies are looking for answers. RPO may, or may not, be the right answer for your particular organization, but after reading this simple guide you’ll have a better idea if it’s time to look into a recruitment process outsourcing solution for your company. As you’ve probably figured out already, RPO stands for recruitment process outsourcing. In its simplest terms, recruitment process outsourcing involves tasking an external provider take charge of some or all your organization’s recruitment process. Some recruitment process outsourcing providers completely take over an organization’s recruiting function, while others work with a company’s internal team. Some RPO vendors have one-size-fits-all services, but many recruitment process outsourcers provide custom service plans to meet organizational needs. Recruiting process outsourcing isn’t new, even though it’s still largely misunderstood. With more than eighteen years in the industry, RPO has evolved to become much more than just outsourcing the recruiting of candidates. Today’s more agile vendors bring recruitment process outsourcing to companies of all sizes, focus on quality of service, and challenge the status quo in recruitment. As an industry leader, the RPOA definition indicates that recruitment process outsourcing services are much more consultative and customizable than what a contract recruiter or recruiting agency normally provides. In essence, recruiting process outsourcing is a special classification within the recruiting industry where an external provider operates as an organization’s internal recruitment function for part or all of its jobs. RPOs don’t just fill jobs, they literally manage the recruiting function for their clients. It’s a true partnership between RPO provider and client. So what does RPO mean for SMB? Small to medium sized businesses have a different set of needs than larger corporations. One of the biggest issues for SMBs is the need to manage recruiting costs. For smaller companies, keeping a staff of recruiters isn’t really practical, but neither is spending a small fortune on staffing firms. On top of that, managing dynamic hiring needs throughout the year can be a real challenge. Recruitment process outsourcing streamlines the recruiting process for SMBs and frees up your HR staff to perform their other duties. Not only does that reduce overall recruiting costs, but it also makes hiring costs predictable. The beauty of using recruitment process outsourcing is that it’s completely customized to your organization’s needs. In other words, a RPO can manage your entire process from end-to-end, take care of just part of the process, or anything in between. Although each RPO has their own service offerings, this is generally what you should be able to expect from any recruitment process outsourcing firm. Establishing a new relationship with a RPO vendor should begin with a thorough analysis of your organization so that strengths, weaknesses, and challenges can be assessed. This analysis is the only way to establish benchmarks for the partnership as you move forward. Once an assessment of the current hiring process is made, the recruitment process outsourcer will put together a strategic recruiting plan to improve your hiring process and get you the candidates you need. When it comes to recruiting, finding great candidates is really only part of the battle. Hiring managers play a huge role in the process and ensure that each new hire is a great fit from both a skill and a company culture perspective. Unfortunately, not all hiring managers know how to conduct appropriate interviews, what questions to ask (and what they aren’t allowed to ask), and how to assess the value of those they interview. A RPO provides training to your hiring managers to make sure they know how to interview. They also manage expectations with hiring managers and keep the process running smoothly. While it is possible to work with the recruiting technology platforms that you’re already using, most RPO partnerships include access to high quality recruiting platforms. These platforms help manage open positions, recruitment marketing, candidates, and hiring managers so that the hiring process runs smoothly for each job. Most recruitment technology platforms keep track of candidate correspondence (email and phone calls), track recruiting efforts, manage scheduling for interviews, rank candidates, and keep hiring managers in the loop. While the ultimate goal is to hire great candidates, it’s also really important to track everything within the hiring function. RPOs have access to technology that can analyze every aspect of the recruitment process, from expenses to time-to-fill, and everything in between. Good analytics are the only way to make improvements and ensure that your recruitment is effective. In today’s internet culture, employer branding has become one of the most important factors in determining if your organization will attract the best candidates possible. RPOs help you create and maintain a great employer brand by helping you with your career site, creating job descriptions that pop, and providing great candidate care. As you already know, there are a lot of moving parts in the hiring function. When it’s not running as well as you’d like, that when you start looking for solutions to recruitment problems. Fortunately, recruitment process outsourcing solves nearly all of your hiring challenges. Let’s take a look at the most common challenges and the solutions to recruitment problems that RPO provides. One of the biggest challenges organizations face is the cost of recruitment. For many HR departments, recruiting costs are thought of as simple cost-per-hire without any thought of the true costs associated with hiring (recruiting cost ratio or RCR). The national average RCR in 2012 was 13.9%, but Accolo’s average RCR is less than 6.5%. According to SHRM, the national average for time to fill in 2016 was 42 days. Given the increased difficulty finding qualified candidates, it’s probably higher today. If a position is particularly difficult to fill, or requires specific skills or expertise, it can be even longer. RPO helps solve recruitment problems and shorten time-to-fill by having access to large databases of candidates, and the experience to market tough jobs and source top candidates. It’s frustrating for hiring managers when they only have mediocre candidates to consider for their open positions. No one wants to make an offer to the “least worst” candidate, but it happens when recruitment marketing and sourcing only attract mediocre candidates. 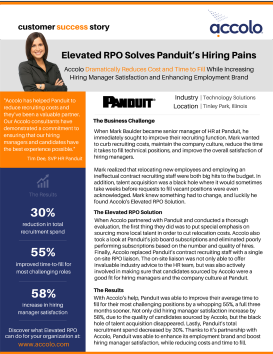 A RPO partner solves this challenge by only providing top candidates to hiring managers. As we discussed earlier, analytics and reporting are the only way to know what’s working and what isn’t within the hiring function. Unfortunately, analytics is often the first thing to fall through the cracks for many organizations, and SMBs are often trying to maintain their records manually. RPOs have the technology and tools to track a wide variety of recruiting analytics so you know how your hiring process is really functioning. Studies show that what candidates want most from a hiring experience is better communication throughout the process. Poor communication can drive away your top candidates, damage your organization’s reputation, and cost you quality hires. As we discussed earlier, recruitment process outsourcing manages your candidate relationships from their initial application until a hire is made so you never have to worry about candidates dropping out due to lack of communication. Hiring manager satisfaction is really a bellwether that tells you how your recruitment process is really functioning. When hiring managers are frustrated, or confused about the hiring process, it can increase your time-to-hire, result in poor hires, and cost your organization money. RPOs manage and train hiring managers to keep the recruitment process running smoothly. An employer brand refers the perceptions that current employees, candidates, stakeholders, and the public have of your organization and what it’s like to work in your organization. Ultimately, your employer brand communicates your organization’s values, personality, mission, and culture. When done right, your employer brand tells people that you are a great employer and your company is a great place to work, and that helps you attract the best candidates to your organization. Recruitment process outsourcing partnerships help you develop and maintain your brand, and makes sure you have a positive relationship with candidates. As you’re evaluating your RPO options, it’s helpful to see a recruitment process outsourcing flowchart to see a visual representation of what the process looks like. It’s likely that the process looks similar to your current hiring process, with a few key differences. As you can see from the recruitment process outsourcing flowchart above, RPOs start the client relationship with analysis and planning, but they also manage recruitment marketing and the recruitment platform. The flowchart represents the RPO path to the best hires for your organization. While there really aren’t any disadvantages of recruitment process outsourcing, there are some special circumstances where the RPO relationship can fail that you should be made aware. For those relationships that don’t work, it usually comes down to a few core reasons. When first beginning the exploration of the RPO option, it’s not unusual for organizations to be under the mistaken idea that all vendors basically operate in the same way. Unfortunately, that just isn’t the case. Sometimes staffing firms call themselves and RPO solution, but really don’t offer the same services. Of course that’s a disadvantage of recruitment process outsourcing if we don’t all play by the same rules, but that’s not the only way a poor vendor choice is sometimes made. Some true RPO vendors only operate in specific industries or niches. Others prefer to specialize in working with very large organizations. Some of these types of vendors will still work with companies outside their normal specialization, but they’ll only offer limited services. If you were to mistakenly choose a vendor that isn’t right for your company, that would put you at a disadvantage with the recruitment process outsourcer. Of course you have to keep an eye on costs, but it shouldn’t be the only consideration when choosing to work with an RPO provider. The lowest bid vendor might cost you less on the front end, but there may be expensive add-on costs down the road. To avoid this disadvantage of recruitment process outsourcing, be sure to compare apples to apples when comparing quotes, and make sure you are very clear on what you’re really getting for the quoted price. One of the biggest disadvantages of recruitment process outsourcing is that organizations can get sucked into the notion that a one-size-fits-all solution will meet their needs. Every company has a different set of needs, and the vendor you choose to partner with should be able to clearly identify those needs and prepare a customized plan to meet them. Creating a true partnership with a RPO is a process that can take 30 days or more, and organizations who think things will magically change overnight will be disappointed. Managing expectations is really important. If they’re not managed properly, this can definitely be one of the disadvantages of recruitment process outsourcing. A good RPO will help you manage the expectations of leadership, hiring managers, and your internal team. Another one of the disadvantages of recruitment process outsourcing is that it really needs executive buy-in and support to be effective. As will any partnership, RPO needs the team to be onboard, and that means that HR leadership must manage and help the department adopt the process and changes needed for the relationship to succeed. A good RPO vendor will work with you to iron out goals to be met through the partnership. The real disadvantage of recruitment process outsourcing is when a poor quality vendor doesn’t work with the client to agree on what success will look like for their particular organization. Every RPO partnership needs clarity on goals and benchmarks to be successful. There are times when an organization is dead set on continuing to use the technologies they already have instead of adopting the more advanced technologies available through their RPO partner. This can be one of the major disadvantages of recruitment process outsourcing because this kind of stubbornness hinders the process and impedes efficiency. Mismatches in technology can create confusion, keep your organization from meeting its goals, and prevent timely results. We’ve already touched on a lot of the benefits of recruitment process outsourcing, but it’s important to be clear about both the disadvantages and the benefits before entering into a vendor relationship. Some of the benefits are pretty clear, but there are also some not-so-obvious advantages. Managing the recruiting relationship with hiring managers can be challenging and time-consuming. When the recruiting function is organized and efficient, it’s clear what’s going on with open positions at all times, and they’re being kept in the loop, hiring managers stop being a challenge and turn into an asset for the HR department. Improving hiring manager satisfaction is one of the major benefits of recruitment process outsourcing. When you work with a RPO vendor, you have a team of recruiters focused on finding you the best candidates without any additional staffing costs. This can help you with difficult to fill positions or fluctuations in your hiring needs. Another one of the best advantages of recruitment process outsourcing is that an RPO has access to a vast network of both active and passive candidates. RPO recruiters concentrate solely on talent acquisition, so they have the time and the means to connect with resources and networks that you normally would be able to gain access. They have a greater reach to find the best candidates. When you can’t fill an open position quickly, it can seriously impact the productivity of your business. Using an RPO allows those open jobs to be filled more quickly. While we don’t know the rates of other vendors, Accolo typically fills open positions up to 55% faster. It’s not unusual for a company to have fluctuations in their hiring needs throughout the year, but it’s often difficult for them to meet those needs. Sometimes they need to hire additional recruiting staff to meet and increase, only to let those recruiters go when their hiring needs diminish. Other times, organizations engage contract recruiters at great expense to meet their increased hiring needs. One of the great benefits of recruitment process outsourcing is that your hiring needs will always be met. In essence, you’re getting more recruiters working for you and it’s costing you less. Working with hiring managers to understand the needs of an open position and making sure the word gets out about the job can be a huge task. One of the biggest advantages of recruitment process outsourcing is that they will handle all of your recruitment marketing, including discovering job requirements, writing job descriptions, posting open positions, sourcing, and everything else involved in making sure top candidates know you have an opening. A positive candidate experience helps you attract the best talent, provides candidate referrals, and improves employee retention. Once a RPO is taking care of your candidates, you can be sure that they keep in constant communication with them throughout the process, manage all the moving parts as candidates move through your system, and take care of phone interviews and scheduling. It’s important for both hiring managers and candidates to have a consistent process for hiring new employees. A haphazard and confusing process hurts candidate experience and your brand, and hiring managers find it really frustrating. RPOs streamline the hiring process and make sure that everyone involved is in the loop when a position needs to be filled. Filling open positions quickly is important, but it’s even more important to fill those positions with the best quality talent and the right cultural fit for your organization. One of the key advantages of recruitment process outsourcing is that they have a team of recruiters that can take the time to sift through candidates to fully assess candidate competencies and fit. You already know that it’s important to keep track of what’s working and what isn’t within your hiring function. Unfortunately for many organizations, reporting is an afterthought. Either they lack the technology to properly track hiring (some do it all manually), or they just don’t have the time to manage it. Because RPOs have access to the best recruiting technology platforms, they can track everything for you and make reporting and understanding your hiring statistics simple. You won’t have to spend hours working the numbers anymore. Your employer brand can be a major deciding factor for candidates when they’re ready to apply for a job or accept a position. Great candidates often take a pass on employers with a bad reputation. Not only is your employer brand important for attracting top talent, but it affects your overall company brand as well. Recruitment process outsourcing helps you build a positive employment image for candidates, helps you attract top candidates, and helps you develop a great employer brand for your organization. One of the most common questions about recruitment process outsourcing is how much it will cost. After all, organizations are looking for a solution that will cost their current hiring costs. Unfortunately, we can’t give you a definitive answer because RPO provides custom solutions for each client. And that means that there will be a different cost for each client, depending on their goals and their specific needs. 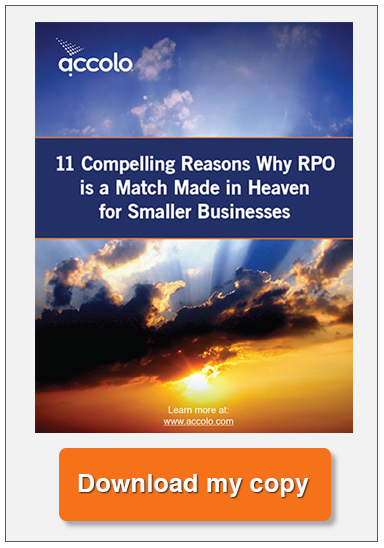 There isn’t a set industry-based fee for specific RPO services. What we can talk about is RPO cost models. Below are the five most common RPO cost models used in recruitment process outsourcing. This RPO cost model is usually used for on-demand RPO services or consulting services that charge per transaction or at an hourly rate. In this pricing model, the vendor charges for a specific process to be completed, like candidate screening or background checks. In this type of cost model, the RPO charges a fee for a specific number of sourced, screened, and qualified candidates for each job. Once this slate of candidates is provided, the organization’s internal recruiters take over the hiring process. This is the RPO cost model where a fee is paid for each candidate that is successfully brought through the hiring process and either offered the position, or hired, by the client. This type of cost model is generally used when the client needs recruitment process outsourcing for a short-term project or when they only want to engage the RPO for a few months. As the name indicates, this RPO cost model is when a monthly fee is paid to the RPO partner for managing the hiring process for a specific number of positions. While the fee is set in the agreement (which can also be paid quarterly or bi-annually too), it may change if the needs of the organization change. For example, needing to increase the number of hires will also increase the management fee. With this RPO cost model, the provider combines the management fee model and the cost per hiring model into a hybrid of both. Under this type of plan, the partnership includes consistent recruiting efforts and management, along with fees paid for successful hires. As you evaluate RPO cost models and the services provided with each recruitment process outsourcer that you’re vetting, be sure to asses the actual services you’ll receive. Although reducing recruitment spend is obviously a priority for most organizations, price shouldn’t be the only consideration. So how do you find the best RPO companies? Of course, we think you should just come to us first (*grin*), but we also think thoroughly evaluating all your options is really important. The RPOA is a great resource for all kinds of information on recruitment process outsourcing, but it also has a comprehensive directory of RPO companies. You can search for RPO companies based on industry, geography, positions, or services offered and view detailed information about each company. Talk to other people you know in your particular industry, or discuss the matter with your friends in HR to discover the best RPO companies used by organizations like yours. Chatting up your friends about it is bound to give you a completely unique perspective on RPO partnerships with different vendors and it will tell you which RPO companies you want to talk to first. When all else fails, search online for RPO companies using the term “recruitment process outsourcing.” You’ll easily be able to find the best RPO companies online, and you can check out their websites and services before you start contacting them to discuss your needs. Regardless of how you find the best RPO companies, be sure to compare their service offering on and apples-to-apples basis so that you can find the provider that best serves the needs of your organization. This is the ultimate question, isn’t it? Should you outsource recruitment? Unfortunately, there’s not a definitive answer to that one, but there are some things you should consider. Is your current hiring process efficient and running smoothly? Are you happy with your current recruitment spend? Is your recruitment department able to keep up with hiring needs? Do you have all the resources you need to find and source top candidates? Are hiring managers happy with the candidates being offered for open positions? Is your team able to fill your open positions quickly? Are hiring managers satisfied with your recruiting function? Does your team know how to do recruitment marketing effectively? Are your candidates consistently being kept in the loop throughout your hiring process? Is your talent pipeline full? Is your team able to offer full reporting and hiring analytics? Do you use the best recruitment technologies? Is your employer brand attractive to candidates? If you’re looking into recruitment process outsourcing, it’s likely that the answer to at least some of these questions is no. In reality, RPO services will benefit most organizations, but it’s impossible to know if it will be the right fit for your company. The only way to know for sure is to discuss your needs with RPO companies that offer the services you need. Want to know more about how Accolo can help your organization?